in Creative & Tech with tags non-profit, non-profit marketing, Seats of Dreams, user experience, website design Both comments and trackbacks are closed. Today, we’re proud to introduce the newly redesigned SeatsofDreams.org. For the last several months, 360i has partnered and worked in collaboration with Seats of Dreams to give them a new, modern and mobile-optimized website. Doing good is a core component of 360i, we believe in leveraging our creativity to spark meaningful change and to support those in need. Seats of Dreams is a non-profit organization that helps underprivileged and sick children attend professional sports games, live theater or concerts. These are children that would normally not have the financial means or access to attend such events. 360i was first introduced to Seats of Dreams through a personal connection and quickly recognized the opportunity to help this great organization tell their story. 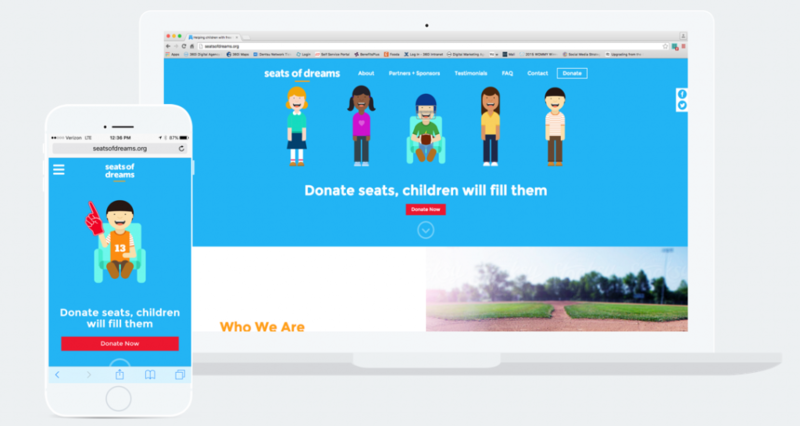 360i approached Seats of Dreams with a new, modern concept for their website that would celebrate their story and streamline the donating process. A key consideration for the redesign was establishing a guided user journey that explained Seats of Dreams initiatives, created ease of use for both the consumer and owner of the site, while building clear steps for donating. The resulting site prioritizes usability and successfully introduces the organization and makes it as easy as possible for visitors to send a donation of tickets or cash. Learn more about Seats of Dreams and check out the new site here. For more on 360i’s work with non-profit organizations, visit our site.